SINGAPORE - The economy expanded at a modest pace in the first quarter, growing 1.8 per cent from a year ago, unchanged from an advance estimate and from growth in the previous quarter. Singapore's manufacturing sector contracted 1 per cent in the three months to March, better than the 2 per cent contraction estimated in April. 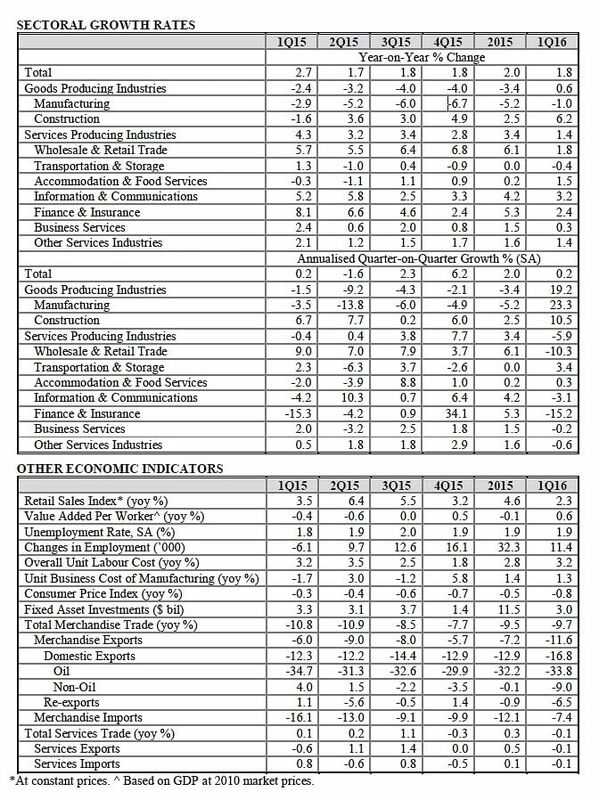 But this was offset by the services sector expanding 1.4 per cent, lower than the 1.9 per cent advance growth estimate. "The global economic outlook has weakened since early 2016, with global growth for the year now expected to be broadly similar to that in 2015," said the Ministry of Trade and Industry (MTI) said in a statement on Wednesday (May 25). 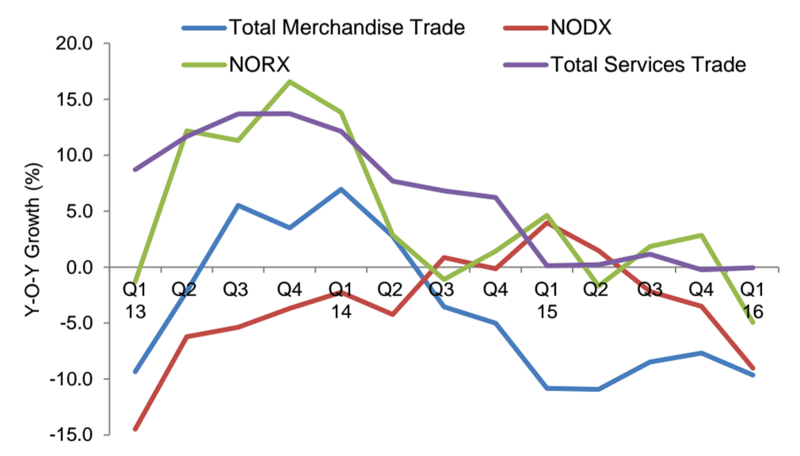 "In particular, the growth outlook for the advanced economies has deteriorated marginally." That said, MTI is sticking with its forecast for the Singapore economy to grow at 1 to 3 per cent this year. Manufacturing was dragged down primarily by the transport engineering and precision engineering. The two clusters were in turn weighed down by the weak performance of firms in the marine & offshore segment and firms that produce equipment for the oil and gas industry respectively. On a quarter-on-quarter seasonally-adjusted annualised basis, the sector grew by 23.3 per cent, reversing the 4.9 per cent contraction in the fourth quarter of last year. On a quarter-on-quarter basis, the economy expanded by 0.2 per cent, slower than the 6.2 per cent growth in the fourth quarter of 2015. Doing the lifting were the finance and insurance industries, wholesale trade and construction sectors . "First, in China, there is a risk that ongoing reforms could have the unintended effect of precipitating a significant drop in demand. If this materialises, China's economy could slow down more sharply than expected. The impact of the slowdown could also be amplified through the financial system should debt defaults spike. "Second, there continues to be the risk of an unanticipated quickening of the normalisation of monetary conditions in the US. Should this happen, regional countries could face large capital outflows, resulting in pressures on their currencies and asset markets. "Third, in the Eurozone, uncertainties in the run-up to the referendum in June on Britain's exit from the European Union, i.e. Brexit, could adversely affect sentiments and investor confidence in the region, thus leading to lower investments and consumption. The loss of investor confidence amidst heightened political risks could also lead to higher debt servicing costs in the peripheral economies."